You want to how how to start getting in shape, but, you have no idea where to begin. Is there a recipe, a ‘prescription’ for getting in shape? Fortunately, the answer is yes, and it is not as complicated as you think. So, no matter what shape you are in now, do not give up. It is never too late to get back in shape, no matter what your age. And this challenge is not just for those who are absolute beginners in fitness. This also applies to those of us who were once athletes, even on the high school and college teams. But, along the way of life, we put on 20, 30, 50 or more pounds and have no clue how to finally trim down. What is the Big Deal If I am a ‘few’ pounds overweight? A body mass index over 30, or waist measurement over 40 inches for men. A body mass index over 30, or waist measurement over 35 inches for women. First, let's find your ideal body weight. Dr. GJ Hamwi created a simple formula to help determine the recommended weight for your height. This formula is known as the Hamwi method. For men, the ideal body weight formula is 106 pounds for your first 5 feet of height, plus 6 pounds for every additional inch. For women, the formula is 100 pounds for the first 5 feet of height, plus 5 pounds for each additional inch. Calculate your ideal body weight before reading the rest of this article. Knowing your current weight and ideal body weight are critical to establishing your baseline. Being aware of your current weight and where you should be will motivate you to start getting in shape. At the end of the day, you are the one who needs to fuel your body with real quality food and implement the suggested exercise program. You cannot control age or family medical history. But you can control what you eat and if you exercise. Being overweight or obese increases your risk of developing high blood pressure. In fact, your blood pressure rises as your body weight increases. Losing even 10 pounds can lower your blood pressure—and losing weight has the biggest effect on those who are overweight and already have hypertension. Losing 5% to 10% of your body weight and building up to 150 minutes of exercise a week may help you to slow or stop the progress of type 2 diabetes. With weight loss, you can slow down or even stop the progression of type 2 diabetes. In addition, you may be able to reduce cholesterol levels significantly by losing 5% to 10% of your body weight, according to the Mayo Clinic. Healthy weight is so important for overall heart health, that the American Heart Association and American College of Cardiology released a new report calling for physicians to create customized weight loss plans and recommend counseling with a dietitian or certified weight loss professional for at least six months. Obesity is a risk factor for many diseases, cardiovascular being one of the most prevalent and fatal. Exercise (besides real quality food) is the most powerful medicine you can buy, yet it costs you nothing, besides your time and effort. 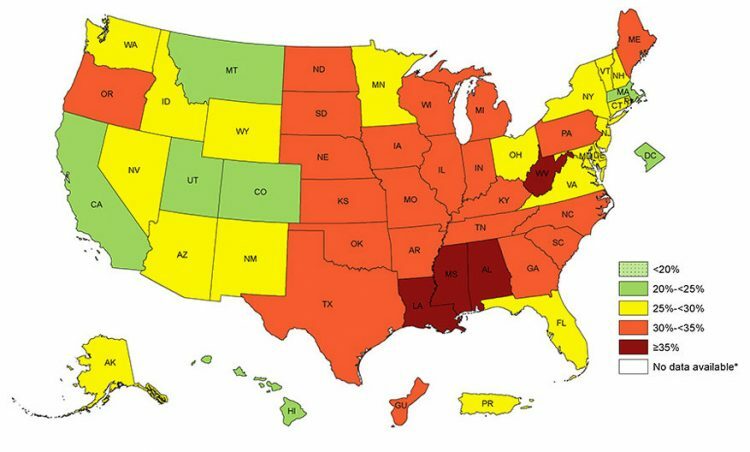 Take a look at the obesity map of the United States below in Figure 1. 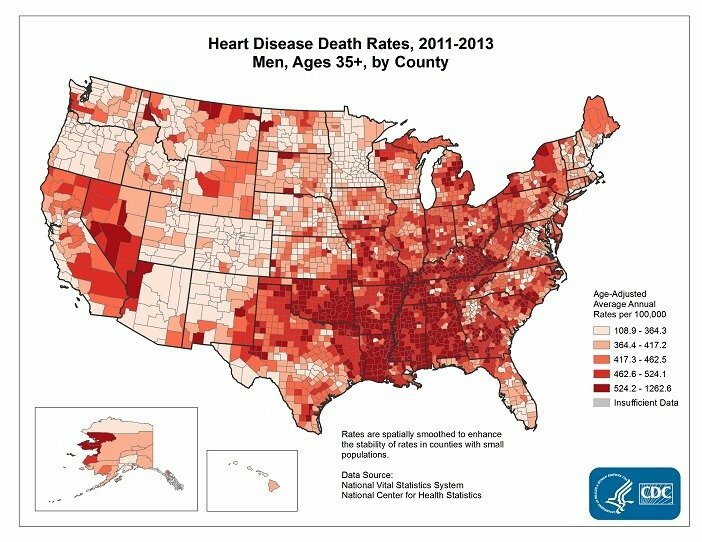 Now look at the incidence of cardiovascular disease in the US as illustrated by figure 2 , and you will see a striking similarity to the obesity rates above. Now we can understand why people are so focused on losing weight. We know intuitively that a healthy weight is more likely to produce health. Just losing weight alone is going to help you avoid type 2 Diabetes, hypertension, high cholesterol and a lack of physical activity. Once you are at a more comfortable weight, it will be much easier to exercise. If you are a man over 45 , or a woman over 55 , then you already have one risk factor for heart disease, the main killer of men and women in the United States. This is why getting your weight under control is so critical. Fear is the great motivator, and fear of all of the complications brought on by obesity is real. Now that you know some of the negative effects of excess weight, there is no reason to be despondent. How to Start Getting in Shape – Where to Start? The first step is to establish a routine of 3 meals and at least one snack every day. A foundation of consistent fat loss is having a regular meal pattern. Because, when you skip meals, your body gets distressed. Stop starving yourself to lose weight. Skipping meals is not the way to lose weight and certainly not fat. The opposite is true, skipping meals promotes belly fat storage and increases the risk of insulin resistance. By skipping a meal, your body does not know when the next meal is coming. As a result, your body will hold onto your fat reserves very tightly. Just one pound of fat in your body, stores 3,500 calories. Your body will not release that fat if your body believes that it needs to hold onto the fat. Instead, your body will take some of your muscle reserve, which is more expendable. Muscle is your friend, but also very expensive for the body to maintain. One pound of body fat only requires a few calories a day to maintain, whereas a pound of muscle can require between 50 and 100 calories. As a result, your body would rather hold onto body fat instead of muscle. Unless you teach your body that it is not necessary to hold onto your body fat. You do this by teaching your body that it will be fueled every few hours. Stop skipping meals, give your body the fuel it needs to function. By eating regular meals, every day, your body gets used to your pattern. Whatever you demand from your body, your body will adapt. What do you eat? What is your fuel? In a study published by the American Journal of Clinical Nutrition, Jéquier E of the Institute of Physiology, University of Lausanne, Switzerland concludes that the preferred source of energy for your body is carbohydrates. Classic and traditional carbohydrates in many cultures are real foods such as vegetables, fruits, legumes and whole grains, which are great sources of carbohydrates. In Asia, rice is prominent as a fuel source. In India, there is rice and lentils. The Middle-East has pita bread made out of wheat flour, and hummus, which is made out of chickpeas. In every culture, all over the world, the main source of energy for thousands of years has been either grain and/or legumes. This is besides the seasonal vegetables and fruits that were available in each geographical location. Stick to real food (as opposed to processed manufactured food) and besides exercise, high quality real food will also be your medicine. You can add a hardboiled egg. Or a banana, blueberries, grapes, walnuts ( a tablespoon or 2!) 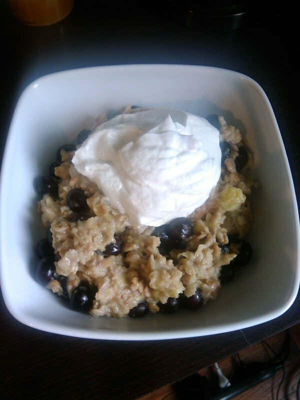 and a plain or vanilla greek yogurt (try to use a brand with low grams of sugar). Or a slice of whole wheat toast, a tablespoon of natural peanut butter, some slices of banana or strawberries on top. Whole wheat pita, vegetables like cucumber, tomato, pickle and a small can of tuna with a tablespoon of mayo. Left over stew made of beans/chicken/meat/potatoes and a vegetable. Tuna fish sandwich with vegetables on rye bread. 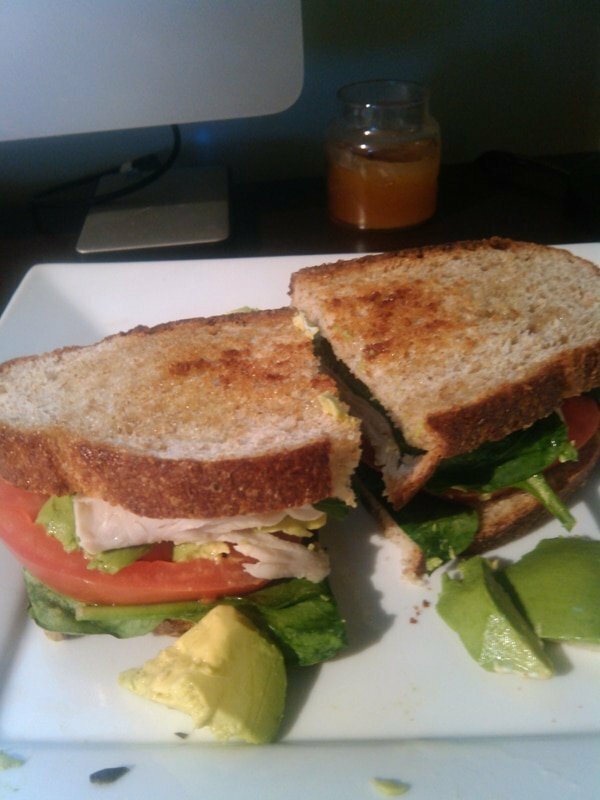 Simple turkey sandwich with raw vegetables and avocado. Or how about a red lentil pasta, asparagus, mushrooms and salad. You never heard of red lentil pasta? Lentil or other gluten free pasta is a great option for people who are gluten intolerant. Red lentil pasta for example is packed with protein as well as carbs. Just top your pasta with your favorite vegetables, like asparagus and/or mushrooms and you are good to go! As soon as you switch from processed food to real food, you will begin to see the difference. The reason that America is the fattest country on the planet is because we rely on processed food more than any other nation on earth. However, because fast food is our habit, it is not an easy one to break. One effective concept I heard from Joshua Rosenthal of the School of Integrative Nutrition is ‘Crowding Out'. The idea of crowding out is to focus on real food like vegetables, beans, fish, fruit and not completely restrict the ‘junk' foods. Have your favorite processed food once a week, or at a social event. But for the majority of your meals for the week, focus on real food. That is the ticket to transforming your body from out of shape to in shape. Real food is the secret key for how to start getting in shape. The third pillar of how to start getting in shape is to start moving and burning calories. Now that you have your regular meal times, you want your body to know that you need to burn more energy. What is the best way to do that? Is it by starving and eating less? The answer is no, because there is no reason or need to starve your body. Your body needs energy; your brain needs glucose to think, to remember and to learn. The best way to burn fat then, is by demanding more from your body in the form of movement. Your body is built to move. Sitting around all day just trains your body to sit. But, if you do 30 minutes of cardio 5 times a week, your body will get the message to start burning fat for energy. The point is that by asking your body to burn more calories through movement, this is the way to burn through your fat reserves. At the least, make sure that you are doing some sort of exercise 30 minutes a day, at least 5 times a week. This is the recommended level of physical activity for an adult according to the American College of Sports Medicine. Walk, swim, run, hike, row, do something and get moving. 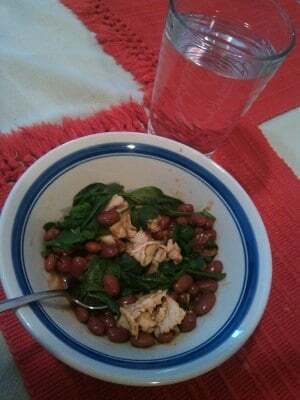 Establish a regular meal pattern of 3 meals and one snack every day. Such as meals with vegetables, whole grains, legumes, protein, fruit, nuts and seeds. Instead of ‘dieting’ and ‘restricting’, ‘Crowd out’ junk food by focusing on real food. Exercise at least 30 minutes a day, five times a week. These are 5 powerful ways are the fitness prescription for how to start getting in shape. Do not be surprised three months from now when you are over 20 pounds lighter and looking and feeling better than ever. What do you recommend for a beginner to get fit?